Many new clients that come accross our services ask us about our methods. For some it seems like a very strange thing to do to wash a car without using water. So we figured it’s about time to take a moment and explain the great advantages of a waterless car wash.
It’s absolutely redundant to state for the thousandth time that this planet we all live on has limited resources and I believe we all became very aware of the fact that wasting the resources that we had for so long got us to the point where we need to be extremely careful with whatever is left. So that’s pretty much when the whole concept of “waterless car wash” was born. Ever since then the chemicals we use have been perfected and we are at a point right now where a car would absolutely look so much better after a waterless car wash than after a regular one, when you hose down the car and then you wipe it out, leaving all sorts of marks and realizing that you put too much effort into something that does not deliver the results expected. Here’s how it works: this technique uses a product that contains many different ingredients, including wetting agents, lubricants and protectants. The detergents and wetting agents in the product combine to soften and emulsify surface grime, while a specific blend of fluids and lubricants attach a microscopic layer of protectant to the surface. The protectant is often an extremely rare (and expensive) substance which provides a bonded layer of protection against any remaining abrasive not broken down by the detergents and wetting agents. The protectant often contains extensive cross linked polymers, which make it extremely effective as a car wax or glaze. The product often contains a complex mixture of cleaning elements along with the glaze ingredients. 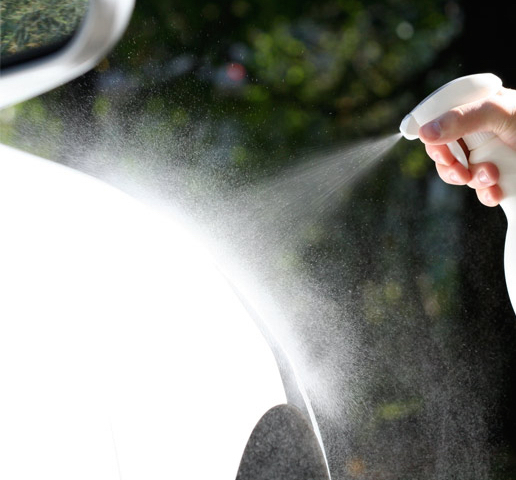 With proper application, the product lifts dirt from the vehicle by emulsification. The product surrounds dirt molecules, lifting them from the paint surface, before you start to wipe. At the same time, the application process initiates the cross chain polymer linking process that results in an extremely shiny, highly protective glazed finish. All this happens very rapidly due to the balance of ingredients within the product itself. The application process does not involve high pressure nor extensive rubbing and also does not require “soaking” – using a high volume of product. When used as directed the vehicle will shine, and water will bead on it. This process does not scratch the paint or affect it any way. In fact, it’s been proven that the regular car wash is much more aggressive and it can cause much more damage, because when you spray high pressure water on your car you will only remove the most superficial layer of dust and grime, leaving the rest to be scrubbed down with the sponge and leaving visible marks, also known as “feather marks”. So those are a few reasons why the new concept caught so fast on the market and why regular car washes will soon be history. We’re always improving our methods and keeping up with all that’s new on the market. And our specialists work hard to come up with the best methods to efficiently clean a car faster and better than before.